From the day of its independence, Pakistan’s relations with the former Soviet Union (Russia) have been subject to a fundamental question which most experts both in the academic and practitioner circles identify as the foundation stone of Pakistan-Russia Relations. This question relates to whether Pakistan ever really had the infamous ‘Russian option’. The well-known visit of Liaqat Ali Khan, the first Prime Minister of Pakistan, to United States in May 1950 is claimed to have set the direction of Pakistan’s foreign policy — making Pakistan forevermore an ally of the US and the Western bloc and therefore ‘necessarily’ in conflict with the USSR — and throughout the Cold War period, Pakistan’s relations with the former Soviet Union progressed in this direction. Whether there was ever a formal invitation from the USSR or a mere verbal communiqué, the result remains the same – given the evolving strategic environment of the time, Liaqat Ali Khan’s visit to Washington was not perceived or received well in Moscow. This visit has been a historical ‘stigma’ of sorts for Pakistan and a dominant factor in defining Pak-Russia relations in the following decades. It is important to remember however, that Pakistan’s foreign policy has always evolved through a vicious cycle of reactions to developing circumstances, and it has never been proactive or designed beforehand. Pakistan-Russia relations have often been the victim of unsystematic foreign policy decisions and patchy fixes, as a consequence of which there has been little to no stability and very little progress. While there has always been great potential for economic growth and political rapport between the two, it has never managed to get materialized in a progressive fashion. Today, the scenario of regional and international politics in South Asia is about to change in light of the US withdrawal from Afghanistan, and particularly given the recent rapprochement between Iran and USA on the nuclear deal. The region is in for a massive upheaval; the US will be scaling back from Afghanistan, the nature of interest of regional players and the great powers will be changing, perhaps over and over again in short periods of time. It is therefore a vital necessity of the time to reflect on Pakistan’s foreign policy and relations, deliberate and develop viable policy options for how Pakistan can diversify its foreign policy and broaden its diplomatic options. CPGS has taken an initiative in this regard by organizing and conducting a Monthly Seminar Series, Pakistan Foreign Policy Review, analyzing bilateral relations with a different partner state in each session, with the aim of better understanding global and regional dynamics and Pakistan’s relations with these states. 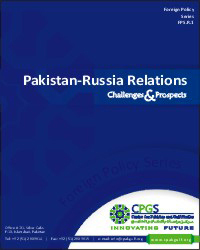 The first CPGS seminar was “Pakistan-USA Relations: Convergence and Divergence” and this seminar focuses on “Pakistan-Russia Relations: Prospects and Challenges”.